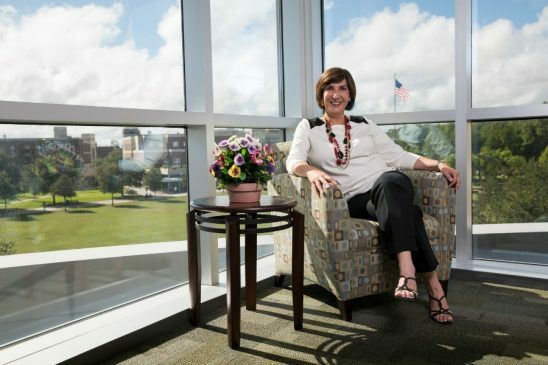 Deborah Beidel, founder and director of UCF RESTORES. As more veterans come home from war, and as our own first responders deal with more instances of tragedy, Deborah Beidel said her work treating Post-Traumatic Stress Disorder is more important than ever. But even as the UCF Restores clinic sees more patients needing treatment for PTSD, their funding remains uncertain. The method incorporates virtual reality combined with group treatments for anger, depression, guilt, and social isolation using a unique three-week program. The intensive treatment has significantly improved symptoms in most patients, with about two-thirds no longer showing the clinical criteria for a PTSD diagnosis. Beidel said that a six-month follow-up showed no relapses. The clinic’s work on PTSD was funded in 2011 with $5 million in grants from the Department of Defense. That money ran out last year, the clinic has been dependent on philanthropy to keep providing needed services. One donation, $200,000 from UCF Alumni James Rosengren, who also has pledged $1 million in total to an endowment to help fund RESTORES, is currently being used to offset clinic costs. Beidel said another $25,000 donation from an anonymous foundation is helping treat 25 more veterans, active duty service personnel or first responders within the state of Florida. All treatment is free of charge allowing the clinic to provide services to people who have nowhere else to find help. But the clinic needs steady funding to continue its work, Beidel said, and so it doesn’t have to turn people away or set up long waiting lists. This year, UCF is hoping bipartisan legislation moves forward to help fund the clinic, which is helping so many in Central Florida and throughout the state suffering from PTSD, said Daniel Holsenbeck, senior vice president of University Relations and the director of governmental relations. Democratic State Sen. Linda Stewart and Republican Rep. Mike Miller made a bipartisan appropriations request to help fund the clinic and university leaders are hopeful the legislature will approve the request. The vision of UCF RESTORES is to serve all of Florida’s citizens who suffer from PTSD as a result of traumatic events. This includes not only veterans/active duty personnel and first responders, but also civilians who have been affected by traumatic events (such as the Pulse nightclub shooting), Beidel said. Beidel’s ultimate goal is that there would be a mix of funds coming from individuals who have insurance coverage, as well as governmental and philanthropic sources. Ideally, she’d like to set a $10 million endowment which could cover operating expenses in perpetuity but that is a long term goal and short term solutions are currently needed.